Some of you asked for a line drawing of the twisty top. Of course, this is a perfectly reasonable request but eh... It is my own design and although I can make tech drawings, I'm by no means an expert. In this case, I tried and failed to make anything which could serve to clarify the design. So, instead, I took a picture of the pattern pieces. 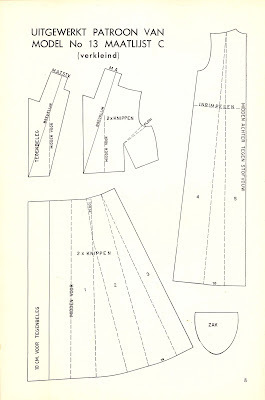 On the left is the front piece, which is cut once out of a single layer of fabric (the line. which you can just see, is to indicate the grainline). 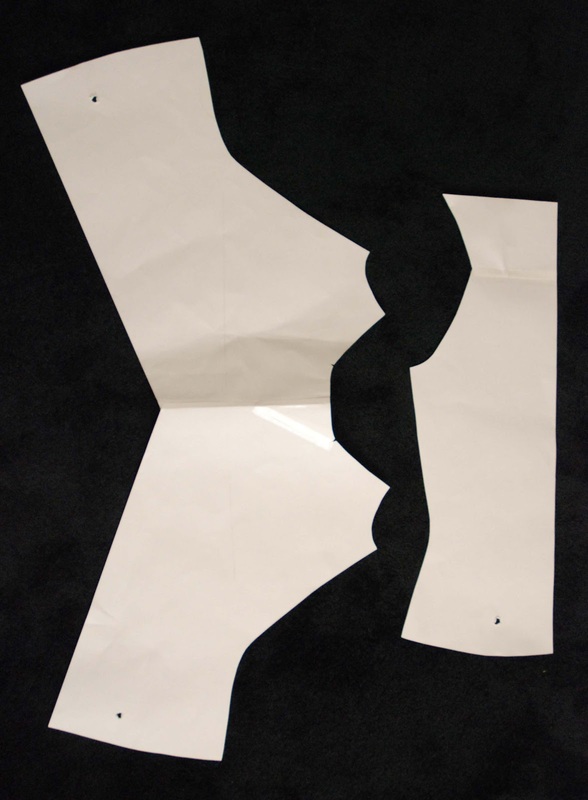 On the right is the back piece, with a cut-on facing at the top. This is cut once, on the fold. 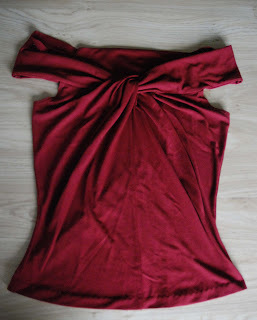 I fused stretchy, light-weight knit interfacing to the back facing. With these two pieces, I cut a striaght band of fabric for the sleeves/collar which was 27 cm wide and 75 cm long, with the straight-of-grain running lengthwise (to make it not too stretchy). If you read her blog, even occasionally, you may know that Tanit-Isis doesn't need any encouragement to go on with her 'project drop waist'. This is a valiant search to create a flattering option for full skirted dresses on a body which (she tells us) doesn't look good in a garment with a seam at (and therefore a full skirt sprouting from) the waist. It just so happens to be that several of the patterns she considers for this treatment are vintage ones... And by hearing 'full skirted dress', we immediately think 50's anyway, don't we? I'll show you some of the options offered by sewing magazine Marion here (most of the fashion magazines are either bound into books or too large to fit under the scanner and it's too dark for picture of things in books. If you'd like I'll show some from those later). This one, from July 1954 is the earliest one I could find tonight. It's more like a waistlength bodice with a yoked skirt attached to it but it's definately going in the drop-waist direction. 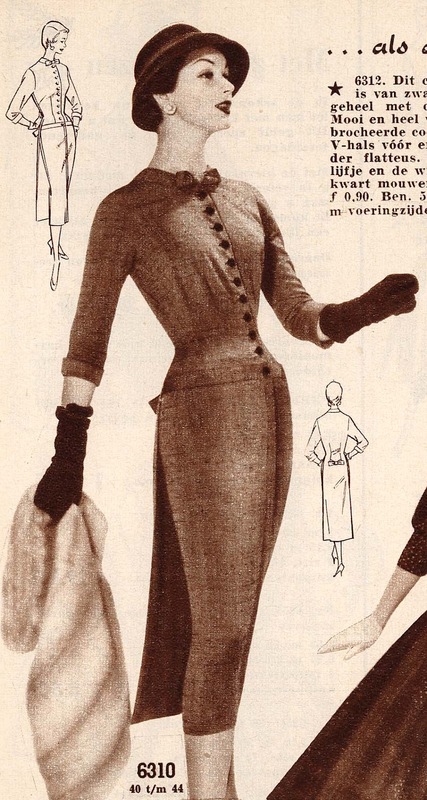 By 1955, the look had definately gained in popularity and this cocktaildress, with the lowest waistline of them all, proves the point. 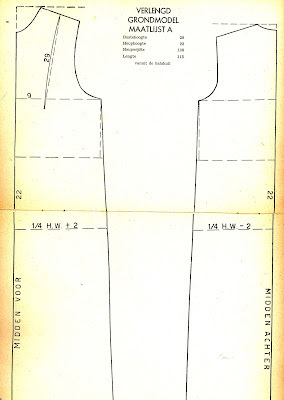 This is, quite clearly, a real drop-waist design. The same magazine also offers this, somewhat less appealing, dress in size 38. It does show another fairly common feature (of which I thought I had seen a great example in Marion, but I can't find it now): a decoration of that dropped waist seam with a strip of fabric. It's usually done in the dress fabric, but can be used to great effect when combined with stripes. Generally, the dropped waist was seen as a youthfull look, so it's no surprise to see it offered in the teenager section in December of 1956. 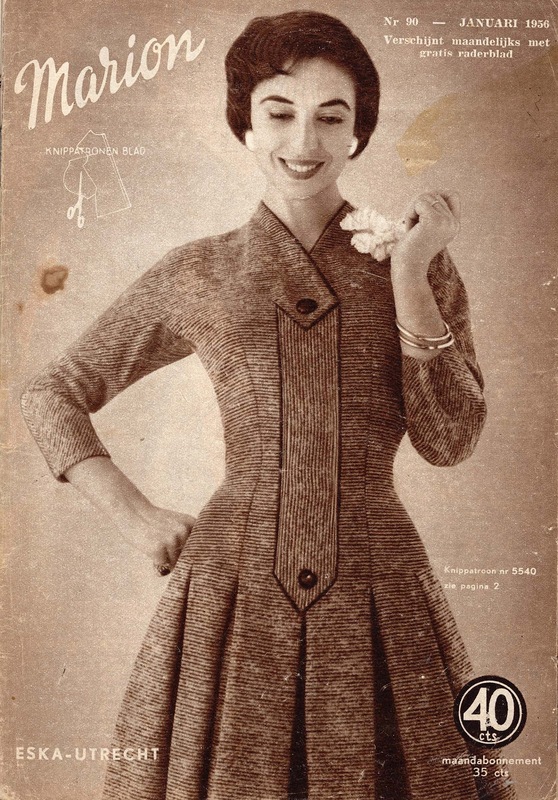 There is another design in the same issue which had a dropped waistline but is definately not intended for teenagers. It is also the only example I've found in Marion where the the lengthened bodice is not teamed with a pleated or gathered skirt. I think this dress is so sophisticated with it's sleek skirt. At the back, the bodice actually continues in a free-hanging panel which is what you see peeking from the back of skirt (and could be mistaken for a deep pleat). There are other clever designs in which the long line of the bodice is really incorporated into the whole look, like this one in which the space between the darts gets a different kind skirt. 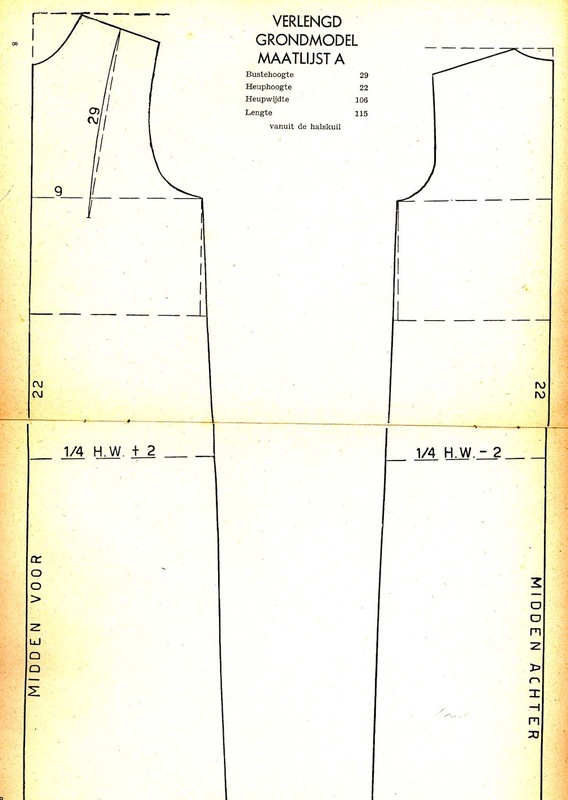 This is a look which appears fairly often: it's not a single bodice which reaches till about 10 cm below the waist, it's a waist-piece with a gather bust-piece on top and a pleated skirt on the bottom. 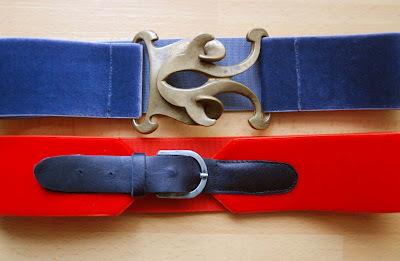 Designs like this are, unlike 'real' drop waist ones, often shown worn with waist belts and they are, also unlike some of the other ones, always closely fitted. 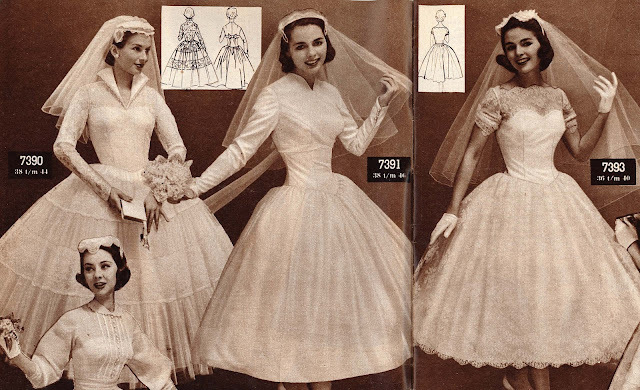 Finally, these short wedding dresses (a length described as 'foot-free') are the only examples I've found in which the seam between bodice and skirt is shaped. 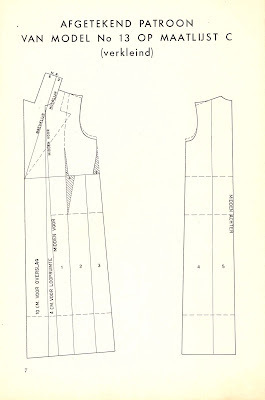 The one on the left is just a waistlength bodice with a slight dip at center front, the other two are a bit more serious, with the middle one once more showing a waist-piece design. I hope you all enjoy this little voyage through the fashions of our mothers or grandmothers. As said, I can show you examples from mid-1950's RTW as well, if you'd like. 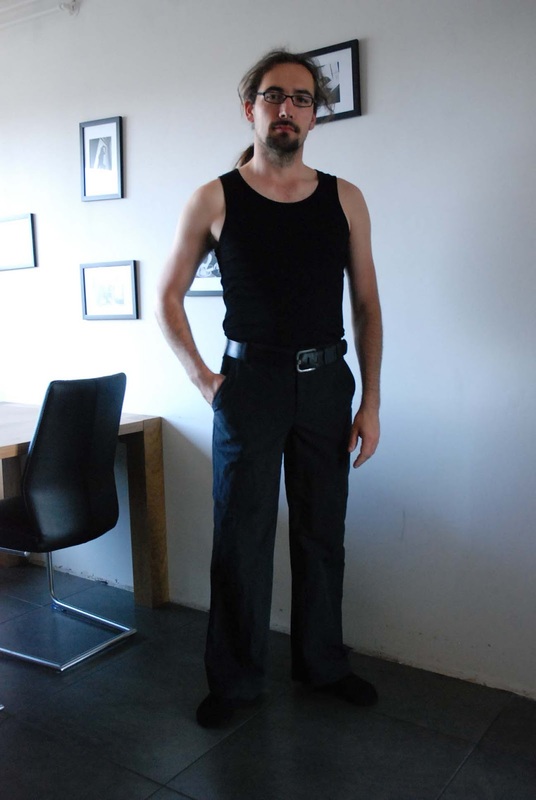 Anyway, I drafted shirt and trouser slopers for him a few years ago and use those to create new items. Usually, new shirts don't even make it to the blog anymore (after all, I've made a dozen already...). Even with other items, I often don't bother asking him to pose for pictures. Unless, of course, it's something I really haven't done before, like the coats. 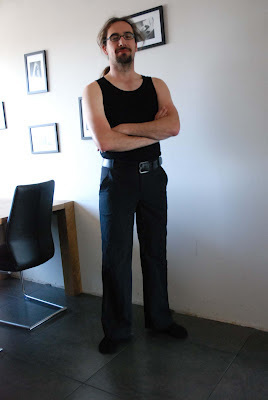 This past week, I made trousers for him. Normally, E lives in Levi's 501, but in summer, those can get too warm and shorts are not all that work-appropriate. So, I set out to make him a pair in a relatively thin and airy fabric. 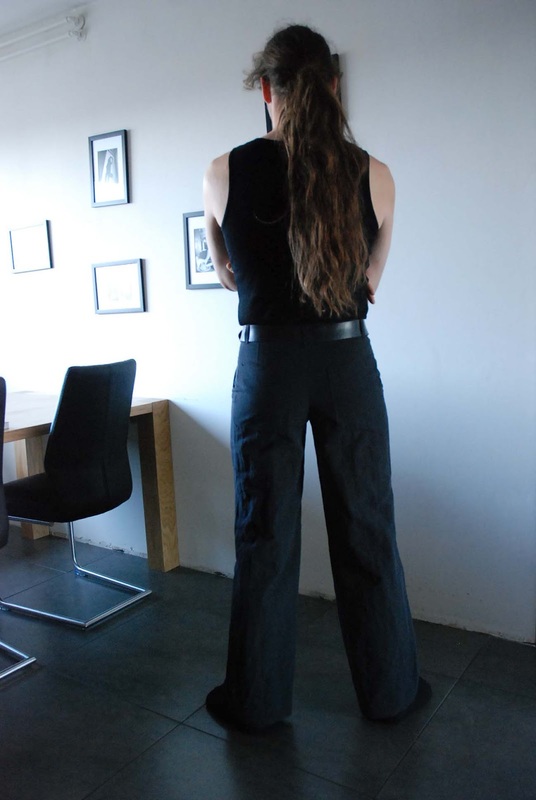 In fact, I bought more of the fabric I used for my jumpsuit for this purpose (and a pair of trousers for me and... eh other things. I bought 5 meters). 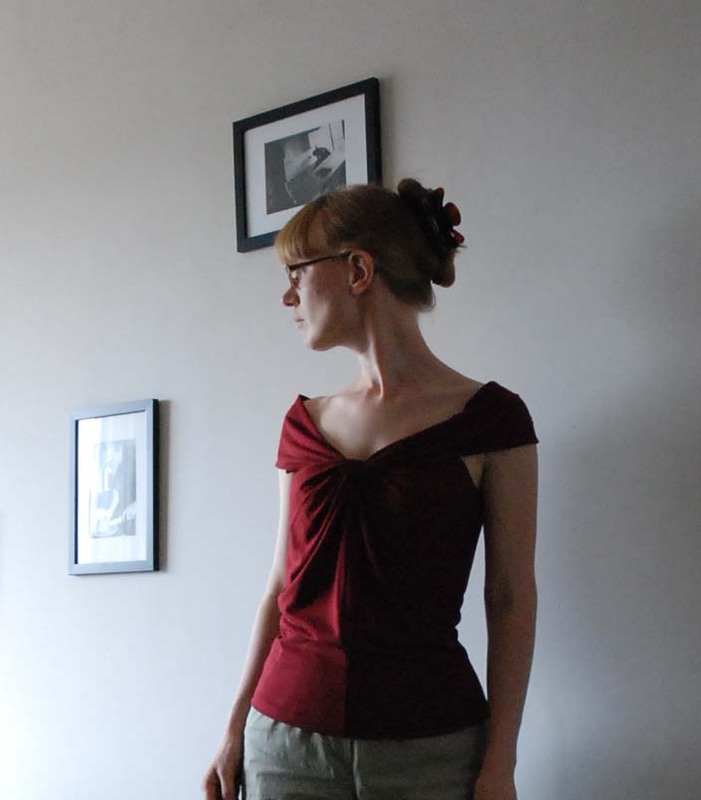 As a pattern, I just used the trouser sloper, the fit of which has been fine-tuned over several pairs of shorts (the latest of which I blogged about here last summer). I have some doubts about the slanted pockets I used this time. They seem to gape a bit more than I'd like (they're fine when the trousers are flat on the table, I didn't stretch those edges, in fact, I stabilized them with strips of fusible interfacing. It's really down to his built and posture combined the placement of those pockets). 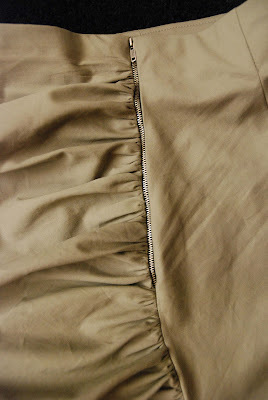 It may help if I just add tacks at top and bottom of the pocket opening. Anyway, it doesn't bother E. He put the trousers on this afternoon because I wanted to take these pictures and he hasn't taken them off yet. I think the overall fit is rather nice. It's the first time I added belt loops. It's one of those fiddly details I often skip on but E usually wears a belt so they went on by request. I actually think they look good and didn't cost that much time after all. 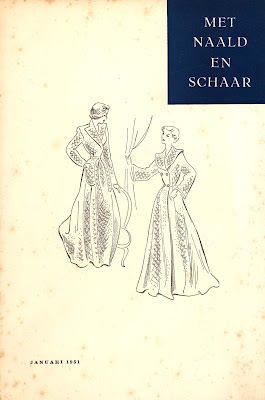 Did you ever bother to sew a bathrobe, a morning gown, a house coat or whatever you'd like to call it (and at whichever informal time of day you'd like to wear it...)? So, it was time for another one. A little warmer and quite a bit more respectable. I saw this as a good opportunity to try out another of the vintage pattern things I have recently acquired. I own several of these booklets from the 1950's and 60's. They are from an 'easy drafting' series called "with needle and scissors". 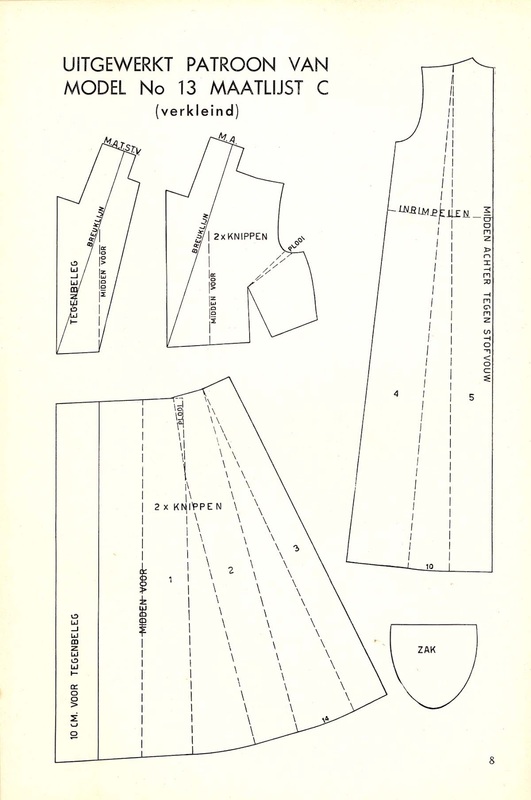 I've written about the 1960's ones before but back then, I didn't have the sloper required. As it turned out, that was in the 50's booklets I bought a little later (it looks like they did a 'sloper issue' once a year). So now, I could really try and use this method. The method for introducing a bust dart is particularly slap-dash. You are suppose to cut the line in the sloper and make a fold in to the armscye, creating an opening which then becomes the bust dart. At no point in any of the booklets do they explain how to calculate the width of this fold. I picked the robe on the left for this experiment. 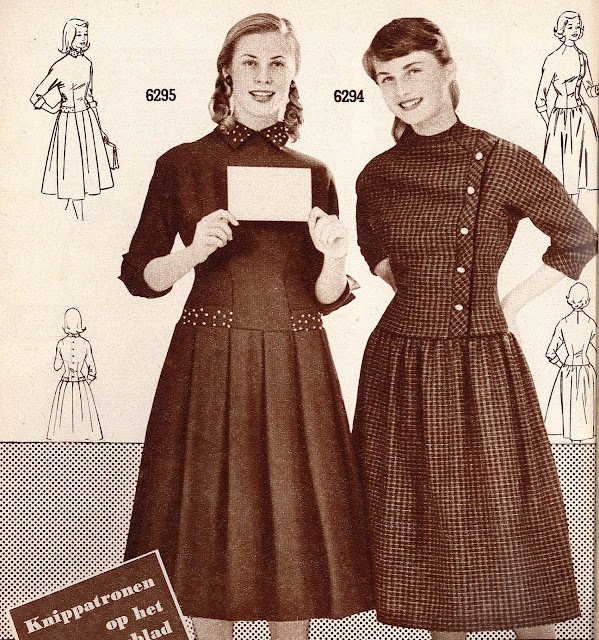 I love the look of the one on the right but a fitted bodice doesn't seem very comfortable. This one supposedly has a fitted front and some ease at the back which is fitted to the waist with elastic. I followed the book in drafting it, making the darts where they told me to and drafting the collar according to the same instructions. Then, I picked a nice cotton from my stash. I like a paisley print, so I couldn't resist this one when I found it on sale for 1 euro/meter. However, it's pretty loud for a dress and I don't like the fact that it has a regular 'set'. In my mind, a paisley print should not have a clear order and repeat. So, this rather nice smooth cotton seemed ideal for this project. I bought some plain dark blue cotton to create a contrast at the collar, the sash and the (introduced into the design by me) sleeve turn-ups and pocket flap. This is how it turned out. I love having a full-length robe (in fact, despite the nice drawing, the pattern was described for an over-all length of 1.20 meter, so I lengthened it to taste). I've never used facings on a bath robe before and I although the look in great, you have to pay attention to the sleeve facings when putting it on and at this length, the front facing easily shows half-way down the skirt (of course I could sew them down). I'm still not sure about the darts and the shape they make but this was never meant to be a fitted garment. 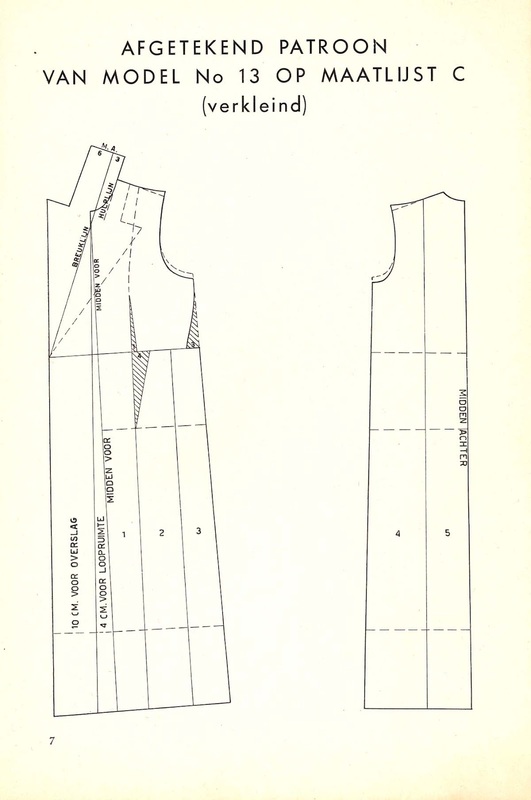 The only real flaw are the drag lines from neckline to armpit, indicating either a too tight back neck (although it was fine in the sloper) or some issue with to collar. Possibly both. It's not uncomfortable, so it won't be an issue for an indoor garment like this but I will have to keep it in mind for any further "with needle and scissors" projects.